Click here to open documention for Magento 2 PBI Extension. This document intended to be used to support end users in usage of the Power BI Integration extension for Magento 1 developed by Kyrylo Kostiukov. Configuration part provides information on how to setup initial configuration and where to find additional information on how to enable integration between Power BI Online service and Magento Store. It provides details on configuring regular data updates between Magento 1 and Power BI and some tips on how it could be done efficiently. 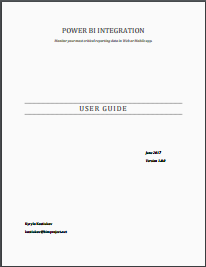 Next part of the User Guide provides some usage examples that may help users to get valuable results from the provided integration between Magento store and Power BI Online service.